I’ve mentioned how much I rely on frittatas to have a real meal when I haven’t really planned ahead. Lately, with all the house drama and packing and such, I seem to be constantly caught off-guard when it comes to meals. A lot of the time, I’ll just throw together a pasta with whatever’s on-hand, but frittatas are actually a healthier, protein-packed option. 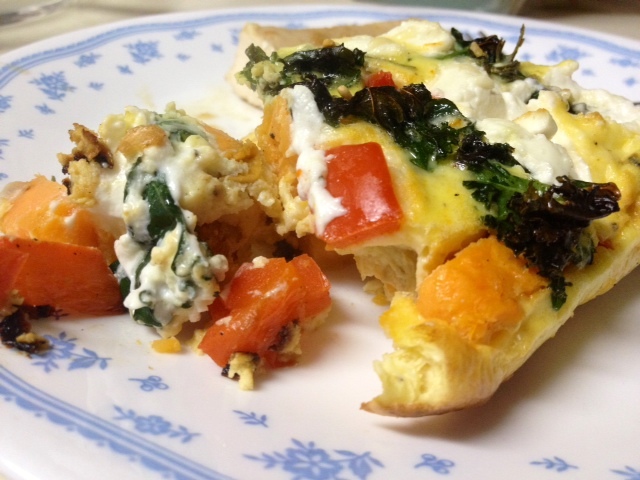 I’ve already shared what is still my current favorite, the spinach frittata with sweet potato hash crust (and goat cheese). So you may be sensing a theme here. I used the same idea of scallions and sweet potatoes to create a delicious, almost caramelized crust, but made a few changes based on what I had in my fridge. 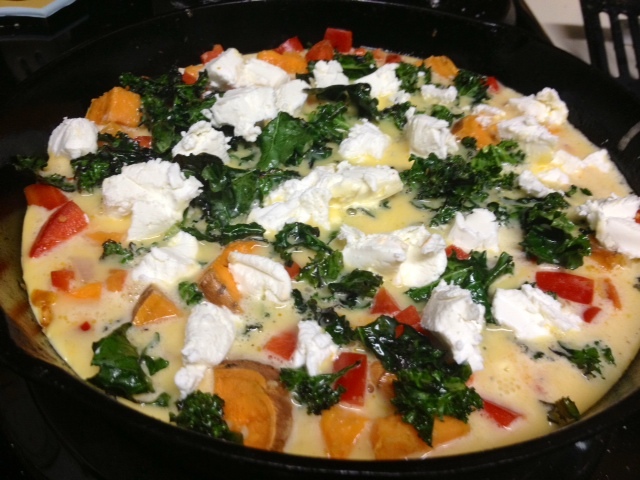 I still used the goat cheese, but added kale instead of spinach and threw in a red bell pepper I’d bought for no good reason. 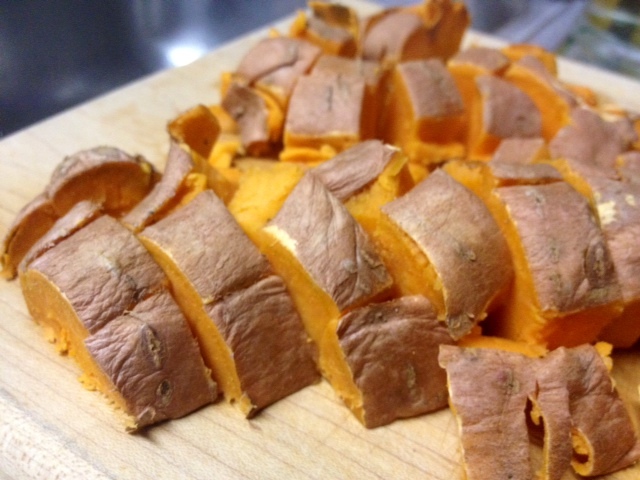 Plus, I pre-baked the sweet potatoes in the microwave to cut down on cooking time—cut it almost in half. 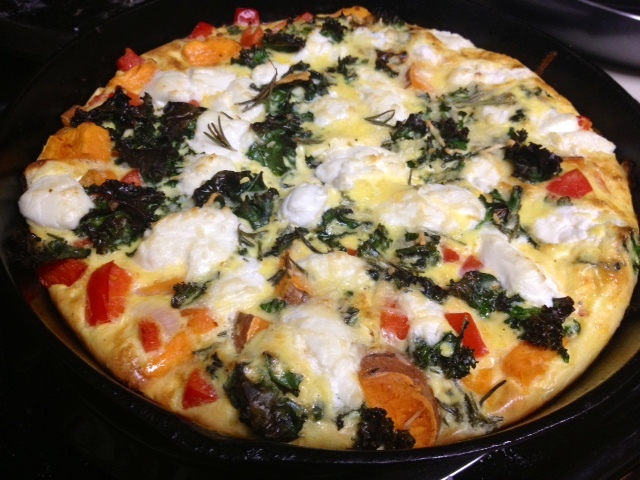 As long as you use basic frittata proportions (for me, that’s 8 eggs and a 1/2 cup of milk), you can basically add anything you want based on what’s in season or in your fridge—zucchini, tomatoes, corn, peppers, greens, any kind of cheese, fresh herbs, potatoes. Go crazy with combinations! 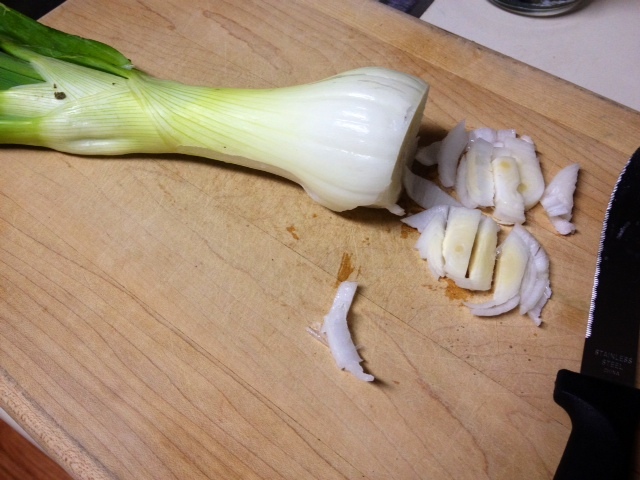 Slice up the white parts of the scallions. 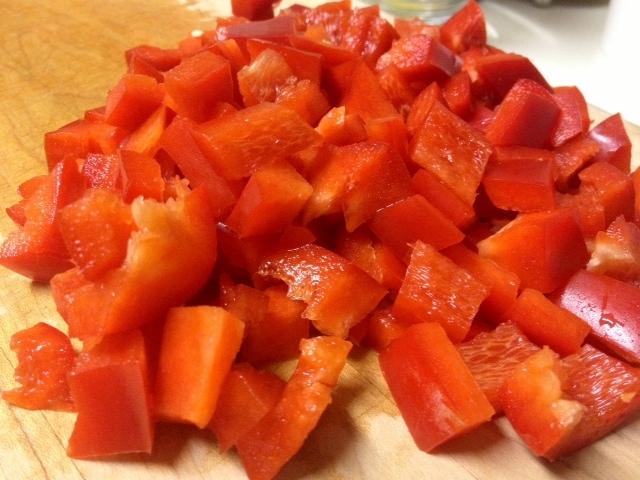 Chop up the red bell pepper, discarding the seeds and middle. To make it cook quicker, pre-bake the sweet potatoes in the microwave. Wash them, stab them several times, then place them on a paper towel-covered plate. Microwave for a few minutes at a time, until the skins get wrinkly and the sweet potatoes and soft. Then dice them into even chunks. Preheat the oven to 425F. Heat an oven-safe skillet with some oil, then add the scallions. 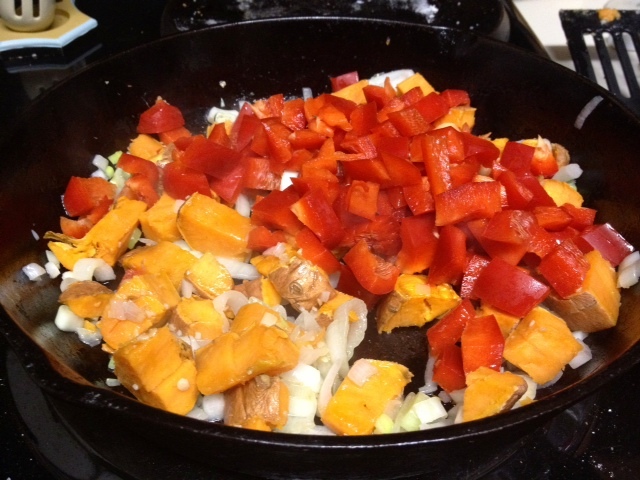 Allow to cook for a minute, til they start to caramelize, then add the peppers and sweet potatoes (and some garlic if you feel like it). Cook for a few minutes, until the peppers start to soften. In a large bowl, blend the eggs, milk, salt and pepper. 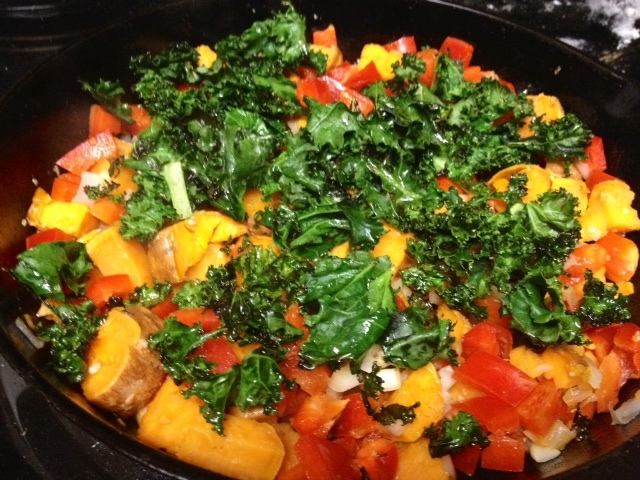 In a separate pan, saute the kale for about 4-5 minutes with some salt, pepper, and olive oil. Then add to the main skillet. 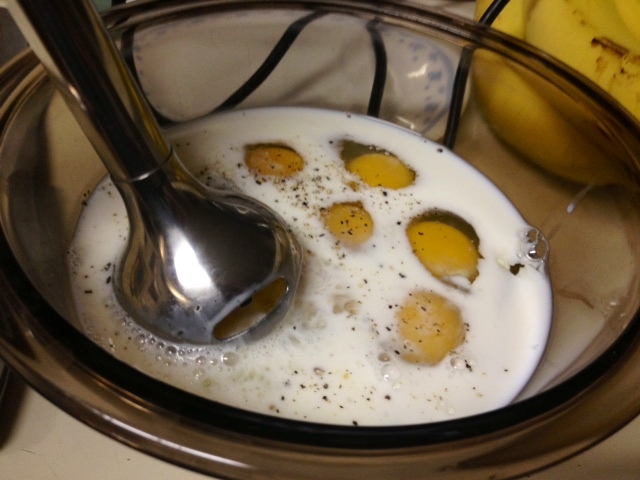 Pour the eggs over the entire mixture, then add dollops of goat cheese all over. Turn the heat down to low and allow to cook for a minute or two, so the edges set. Transfer to the oven to finish cooking, for 12-20 minutes depending on your pan. You want the middle to be barely set, not runny (but don’t burn it). You can switch to broil for a minute at the end if you like it a little more crispy on top. 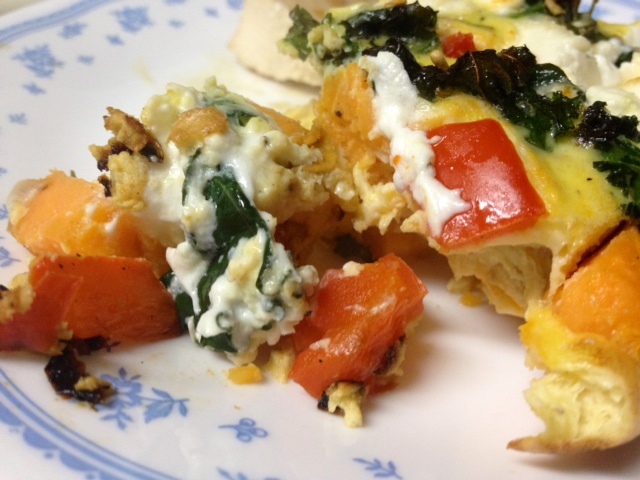 As always, the versatile frittata can be your best friend. I was able to put this together in basically 30-45 minutes from start to finish. Slice up white parts of the scallions and dice the red peppers. Scrub the sweet potatoes and stab several times, then bake in the microwave for 3-10 minutes, until the skin is wrinkly and the potatoes are soft. Then cut them into even pieces. In a skillet (not your main skillet), saute the kale with some oil, salt, and pepper; set aside. Preheat the oven to 425 F. Heat an oven-safe skillet (I used cast iron) on medium heat with some oil, then add the scallions. Allow to cook for a minute, til they start to caramelize, then add the peppers and sweet potatoes (and some garlic if you feel like it). Cook for a few minutes, until the peppers start to soften. In a large bowl, blend the eggs, milk, salt and pepper. Add the kale, then pour the egg mixture over everything. Lastly, cut up the goat cheese and sprinkle evenly in the pan. 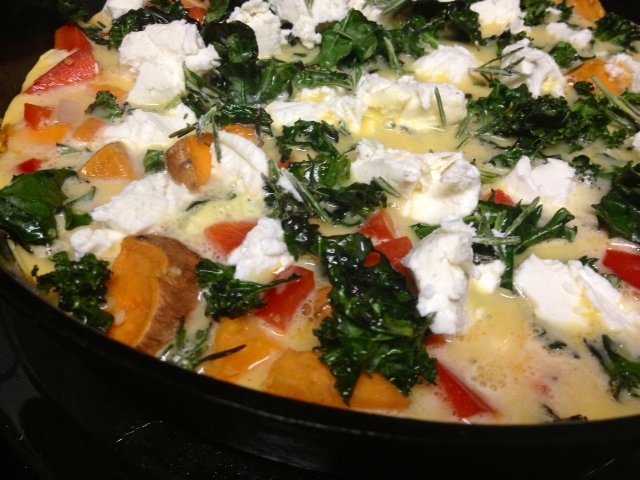 Turn the heat down to low, and let the frittata cook for a couple minutes on the stove, just to set the edges. Then place in the oven to finish cooking, probably 15-20 minutes (though start checking it around 12). It’s done once the middle isn’t runny anymore, if you can shake the pan and see that the middle is just barely set. Remove from the oven, letting it cool before serving. « Health/Fitness Challenge Ideas—and an awesome slow cooker giveaway!